What if the Republicans ended up nominating a Double-G Ticket in 2008, Giuliani and Gingrich? What on earth would the social conservatives and the religious right do if the GOP nominated two alleged serial adulterers for President and Vice President, each married three times, one of them an unabashed supporter of gay marriage, abortion rights and gun control? What if the Democratic Party, in turn, nominated a ticket of Obama and Clinton or Clinton and Obama, one member of which is a born-again Christian and the other a lifelong mainstream Christian do-gooder? This December, after the second set of midterm elections during President Bush's tenure, with the nominations of both parties wide open, is a time for weaving scenarios. And this bizarre one has some chance of coming true. But Rudy Giuliani enjoys folk hero status for how he handled himself after the 9/11 attacks occurred in New York City during his watch as Mayor. (It should be pointed out that John McCain is a genuine hero!) 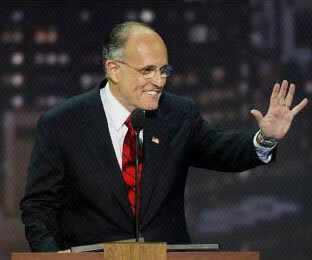 Giuliani also has strong support within the general electorate and will probably be able to raise a lot of money. As this article in The Washington Post points out, if Giuliani can get the New Jersey primary scheduled ahead of the one in South Carolina and he's able to win in both the Garden State and before that, the Granite State, New Hampshire, he might have something called momentum working in his favor. In the meantime, Newt Gingrich, apparently the Freddy Krueger of national politics, is running the most intriguing non-campaign campaign for President I have ever seen. Gingrich, a self-admitted gadfly, loves ideas and right now, he's generating a bunch of them on critical issues. He knows that he can only run for president by artful misdirection, so many are the questions about his ethics, his divorces, and his proto-Delayist politicking. Gingrich offers his ideas to the other candidates, claiming to hope that they will talk about issues and not each other. It gives this one-time hyper-partisan warrior the appearance of being above the fray. And if, over the course of this coming summer, Gingrich's ideas gain traction, but the other contenders for the GOP nomination don't, the way will be cleared for him to make a Labor Day announcement that he's going to run. By sticking firmly to discussing the issues, Gingrich hopes to effectively check questions about his personal life. In short, he hopes to shout down all doubts with incessant wonkiness. The strategy may not gain Gingrich the top spot on the GOP ticket in 2008, but I could envision Rudy Giuliani as a presidential nominee, wanting to shore up his right wing, asking Newt to come on board as his running mate. And just where would the religious right go under such circumstances? My guess is that it would still fall heavily to the Republicans, but not in the proportions it has in recent presidential elections. But my guess also is that we'll never get the chance to find out. I doubt that any of the four potential candidates I've mentioned will be on the national tickets of their parties come November, 2008...Except maybe Freddy Krueger. (No, I'm not kidding.) That's because Freddie--I mean Newt--is more conservative than any of the other candidates in the running for the GOP nod and because he's not associated with any of the policies of the Bush Administration or the past three Congresses. Rudy won't pass muster with GOP voters. Obama is untested. Clinton won't run, knowing she's general election poison in most of America and she doesn't want to be blamed for taking her party to defeat when Democrats' shot at victory in 2008 is so strong. But watch out for Freddie. [UPDATE, IN RESPONSE TO SOME OF THE COMMENTS: A G-G ticket would almost certainly be trounced. This was a post about "bizarre scenarios," mind you. But as I considered it, I realized that it could happen and that of the four potential candidates pictured here, amazingly, Gingrich was the one whose strategy could likeliest put him on a national ticket. Still, I would put his chances at about 1%. But I think those odds are better than those for Giuliani, Clinton, or Obama. Do I like Gingrich as a candidate? I don't get into stuff like that here. I don't do endorsements. Newt is smart, to be sure. But he certainly has issues. It would appear that he doesn't, as they say, put the fun in dysFUNctional. Exhortation is the spiritual gift of those who have the ability to coach, counsel, and encourage their fellow Christians to move toward becoming all God meant for them to be. He was the most demanding teacher I ever had. He was also someone with whom I could talk about anything and to whom I could go for good advice. His name was Pastor Bruce Schein, holder of a doctorate in New Testament studies from Yale. But more importantly, he had the gift of exhortation. We were never friends and certainly not close. He wasn’t my pastor. He was an encourager who came into my life briefly. That's how it often is with people who have this gift. And Bruce Schein arrived at a pivotal time in my life. My experience at Trinity Lutheran Seminary had, until the point when he came to teach there, been somewhat discouraging. If that was anybody’s “fault,” it was mine. Nonetheless, I was in a funk when, lo and behold, here came this passionate, down-to-earth man of faith who pushed and prodded me to move toward achieving my potential. “We want you to become a spiritual Charles Atlas, Mr. Daniels,” he told me once. That’s the aim of every possessor of the gift of exhortation. People with this gift are effective counselors. They’re dispensers of God’s love. They help us see, in a common phrase, that God loves us just as we are but loves us too much to leave us there. The most famous Biblical figure with the gift of exhortation was a man named Joseph--not Joseph, the dreamer, from Genesis, or Joseph, the husband of Mary, from the New Testament Gospels. This Joseph was an early follower of Jesus known more commonly by his nickname, Barnabas, “which means ‘son of encouragement’” (Acts 4:36). At the place we're first introduced to Barnabas in the New Testament, we find him encouraging the whole young church. He sells off his property and gives the proceeds to the apostles so that they, in turn, can help the needy within the fellowship of Jesus' followers. Later, it was Barnabas who had the courage to go to the one-time persecutor of the Church, Saul of Tarsus, who we know as the apostle Paul, in order to encourage Paul’s new faith in Christ. Later, Barnabas argued fiercely with Paul over a young believer named John Mark. Paul wanted to dump the young man because he felt that John Mark had failed him in an earlier assignment. Barnabbas insisted that the young disciple deserved a second chance and decided to undertake a missionary journey with him, apart from Paul. Tradition says that John Mark is the author of the Gospel of Mark. Would Paul and Mark have become the great preachers and writers they became without Barnabbas’ encouragement? Maybe not. The Greek word for exhortation, the word for this gift used by Paul in Romans 12, is paraclesis. A related word is paraclete, a word sometimes translated as comforter, one of the titles Jesus gives to the Holy Spirit. Both of these words are related to the verb, paracleo, a compound term literally meaning to call alongside. The person with this gift walks alongside fellow Christians at pivotal moments in their lives and helps move them to greater Christian maturity. People with the gift of exhortation are usually backstage players, having less in common with motivational speakers than they do with a coach at the gym. And their aim is the same as that identified by Pastor Schein when he encouraged me: To help others become spiritual Charles Atlases. Bible Passage to Ponder: “I want their hearts to be encouraged and united in love, so that they may have all the riches of assured understanding and have the knowledge of God’s mystery, that is, Christ himself...” (Paul, writing in Colossians 2:2). With Whom Would You Rather Hang Out? Dan knows how he answers that question. Tomorrow, I'll be trekking to Columbus, where I'm to offer a prayer for the opening of the day's legislative session at the Ohio House of Representatives. This is exciting to me for several reasons. Another reason for my excitement is that it will be a homecoming, of sorts. Before I went to seminary, I worked for the House. I have a deep reverence for the institution and for the Capitol Building in which it meets. In recent years, the Capitol has been restored and renewed. As a boy and a teen, I often went inside just to soak up the place and all its history. (I once saw Jim Rhodes, the best Ohio governor in my lifetime, chatting one-on-one at the bottom of the marble staircase running from the rotunda to the Senate side of the building. I was with my mother and grandmother at the time and when I caught sight of him, they prompted me, "Go ahead. Introduce yourself." But I was too terrified to do it.) Given the awe of the place I've always had and unabashed love I have for Ohio--I know that seems hokey, but it's true, I loved working there. But I only worked for the House for one year before I sensed God's call taking me to seminary and the pastoral ministry I've done for the past twenty-two years. On top of this, it will give me the chance to spend a few hours in my favorite city on the planet, my hometown of Columbus. And, I get to take my Dad with me. All in all, it'll be a little pre-Christmas fun...and I hope, ministry. Another thing that I think is important for pastors (and others) to remember when they do public praying is that there's a difference between praying and preaching. When we preach, we're out to convince. But when we pray with others, the only real audience is God. It's fine to employ language that invites people to pray along with you. But public prayer isn't a performance. You're not trying to convince those with whom you're praying. And you surely shouldn't use public prayers to score debating points or bash those with whom you disagree. Such practices have nothing to do with prayer! Often, when we pastors are invited to offer public prayers, we use the occasions to impress others. We ramble on in supposed eloquence, all the while subliminally screaming, "Look at me! Aren't I smart, insightful, and spiritual?" Ironically, the worst example of this I've heard happened at a gathering with Billy Graham. About 150 people attended this event and a fellow asked to give the closing prayer couldn't pass up the chance to wow us all. I have a fairly durable attention span when it comes to listening to public speaking. I enjoy listening to lectures, speeches, monologues, and sermons. But as this guy's "prayer" dragged on and on, I found myself offering another, silent prayer. It may have not been appropriate either, but I kept saying, "God, shut him up. Please, shut him up." Finally, after what was probably a ten-minute prayer, he said, "Amen," which as you know means basically, "Yes!" I uttered my own hearty "Amen!" at that moment, thankful that what seemed like a performance disguised as a prayer had ended. As to the constitutional issues associated with praying at a legislative session, I can only say that the courts have consistently held that such prayers, so long as they avoid proselytizing or pushing a particular political agenda, don't violate the establishment clause. Clergy from various faiths are invited to offer prayers at the General Assembly. (That's the name of our state legislature in Ohio.) And going all the way back to the period when our country operated under the Articles of Confederation, provision has been made for chaplaincies in the military and in legislative bodies. The Founders made these provisions despite their commitment to the separation of Church and State and the fact that they were as religiously as diverse a bunch as the new country could muster at the time. Tomorrow, I'll share the text of my prayer, which is a lot shorter than this post. [UPDATE: In a generous link to this post, Don Surber questions whether the courts have the right to tell a legislative body what sorts of prayers may be used. I based my characterization of court rulings on information supplied to me by the House. I'd like to learn what lawyers who read this piece might say. Ladies and gentlemen, I present Benny Hinn. Teaching is the spiritual gift of those with the ability to convey God’s truth and glorify God so that others learn about Jesus Christ. In a congregational context, we usually associate the gift of teaching with those who preach or teach Catechism or Sunday School. In the Church at large, the gift is associated with instructors at colleges and seminaries and with our bishops, who also have teaching offices. Those are good and essential places for people to exercise the gift of teaching, to be sure. We need people who teach God’s Word with care and faithfulness. But the gift of teaching can help the Church fulfill its mission in other ways, too. The most important responsibilities of parents, for example, are (1) to prepare our children for adulthood and (2) most importantly, to introduce them to the God we know in Jesus Christ (Deuteronomy 11:18-21). Parents mostly discharge these two responsibilities by their examples. But if parents have the gift of teaching, they also have an important weapon in their parenting arsenal. Another way people with this gift might exercise it is through mentoring. In my home church was a woman named Martha. Martha was in her sixties when I came to know her, a person of deep faith in Christ who took this rambunctious, out of control twenty-something under her wing and taught me about living for Jesus Christ. Mentors, too, often teach by example. But some with the gift of teaching have the capacity to make the faith come alive for both those within the Church and those outside of it. We can also use the gift of teaching to extend the mission of the Church in non-churchy ways. In that same home congregation was a devoted follower of Jesus, president of our church, and vice chair of the Plant Pathology department at Ohio State. Phil was in his thirties and a husband and a father of four children. But, in the midst of a busy schedule, he taught a class on lawn care at our church building. We publicized his class to the community. It became a means by which we loved the people of our neighborhood in a practical way. Spiritually disconnected people who attended the class saw the Savior behind the teacher. If you get the chance to do so, enrich your Christmas celebrating by seeing The Nativity Story. It's a moving and down-to-earth telling of the story of Jesus' birth. The cast is fantastic. The way the story is told can, at times, be witty, something that I think could appeal to spiritually-disconnected people. While one could quibble with trivial things like Mary riding on a donkey to Bethlehem, which almost certainly did not happen or the wise men being at the stable with the shepherds, which, according to the Gospel of Matthew certainly did not happen, they don't distract attention from the story. One might also quibble with the use of three wise men, even though the Bible doesn't say how many magi presented gold, frankincense, and myrrh to the Christ child. But the movie's portrayal of their decision to follow the natal star and the building up of their faith that results, is a sometimes funny and compelling element of The Nativity Story. The scene showing the birth of Jesus in a barn is so moving, it may bring a lump to your throat. The deity incarnated in a stable. What a God we have! DON'T MISS THE NATIVITY STORY! In a 1997 sermon, Robert M. Bowman tells about a friendship between a former head of the NAACP and the one-time Imperial Wizard of the Ku Klux Klan. They met debating each other, many years ago. The Klansman taunted the black man and called him names. The black man responded that nothing the Klansman could do would make him hate him. He responded instead with love. Over a period of many years, the Klansman would telephone the black man, beginning the conversation by calling him the “N” word. But in 1991, he called and said, “Hello, brother.” He went on to tell his friend that he had left the Klan, had accepted Christ, and was called to preach the gospel, and that his conversion was due to the example of the black man returning hatred with love. By the time that Bowman recounted this story, they co-pastored a church and together preached about God’s love. Last week, in our Bible lesson, we were introduced to the ministry of John the Baptizer, who said that the appropriate preparation for Christmas and for meeting Jesus Christ in our daily lives and in eternity is repentance. Repentance is the means by which our wills, minds, and hearts are opened to Christ and we become more like Him. When repentance happens--when we turn away from sin and toward God, miraculous things take place. That includes Imperial Wizards of the Ku Klux Klan renouncing racism and instead, becoming followers of Jesus. In the very visual Hebrew language of the Old Testament, the word for repentance conveys the idea of a person once walking away from God, changing course and turning back toward God. In the more cerebral Greek language of the New Testament, the word for repentance--metanoia--means to change one’s mind. But repentance needs to be more than a one-and-done deal. Sin is the common condition of the human race and even the most spiritual people you and I might name must fight it every day. Satan, the apostle Peter tells us in the New Testament, is a ravenous lion looking for those he can destroy. You can be sure that if the devil tried to tempt even Jesus, he’s not going to give up on trying to lure you and me away from walking with God. It’s possible for those of us who have repented for our sins to slip up and turn back to sin and away from God. If we’re to keep walking in the free gifts of forgiveness, love, and hope that Jesus gives to all with faith in Him, repentance needs to be our lifestyle. But what does a repentant life look like? Every year in this season, we read or see stage or movie adaptations of Charles Dickens’ classic, A Christmas Carol. As you all know, it tells the story of Ebenezer Scrooge, who one amazing Christmas Eve, is met by the ghosts of Christmas Past, Present, and Future. Through these encounters, Scrooge feels compelled to change his mind and the direction of his life. Near the end of his story, Dickens says of Scrooge, “It was always said of him, that he knew how to keep Christmas well, if any man alive possessed the knowledge.” Scrooge turns from the greed and self-centeredness that was killing his humanity and, according to Dickens, kept doing so for as long as he lived. His repentance became a way of life. Today’s Bible lesson takes us back to John the Baptizer at the Jordan River, preaching repentance. His message doesn’t sound like anything that Oprah Winfrey would say. “You brood of vipers!” he cries out to some of us hearers. He tells them too, not to count on being children of Abraham to get them into the Kingdom of God. The question isn’t what the religion of our parents and grandparents were; the question for each of us is whether we ourselves believe in and follow the God we meet in Jesus Christ. That means being truly repentant. Our lesson says that John encounters three different groups of people who want to know what a repentant, faithful life might look like in their real worlds. The first group are described vaguely as “the crowds.” John tells them to share their extra coats and extra food with others. Then comes tax collectors. John tells them to only collect what they’re supposed to collect. Finally, he’s approached by soldiers. He tells them not to use their power to extort from the people. Notice what John didn't say to any of these people. He didn’t tell the crowds to give away more than they had or could afford. He didn’t tell the tax collectors to stop doing their work. He didn’t tell the soldiers to stop soldiering. In other words, God wants us to live out our lives in the same everyday places we all presently occupy. But we’re called to be light in a darkened world by conducting ourselves with an obvious love for God and love for others. That’s a repentant way of life and it’s only possible when we surrender ourselves to the Savior Whose birth we soon will celebrate. Fred was a member of my internship congregation. Less than a year before I met him, Fred had been in the clutches of alcoholism, an addiction in the grips of which he’d been for a long time. Finally, his wife and family and friends had had enough. An intervention group was organized in which all these people who loved Fred told him that he needed to quit. Their tough love paid off. He enrolled in a Twelve-Step program and he continued to work the steps the rest of his life. Fred turned from his addiction and turned to Jesus Christ. He kept turning to Christ day-in and day-out. What a difference it made in his life! When I first met Fred, I didn’t know his story and when I handed him a cup of wine for Holy Communion shortly after my arrival, I was perplexed that he simply held the cup and, without drinking from it, put it into the tray with other worshipers' empty cups. His daughter and son-in-law later told me that they had been terrified that Fred would drink the wine, but were so proud of Fred and so grateful to God that he’d been able to put that tempting cup down. A lifestyle of repentance is made up of a thousand such little victories, won because we dare to turn from destruction and death and turn to Jesus. As we turn to Christ each day, asking for forgiveness of past sins as well as the courage to resist sin today and to keep walking with Him tomorrow, may the thing be said of us. You see, the ones best able to truly keep Christmas are those who live this lifestyle of repentance, a lifestyle of walking with Jesus. Amen! Prophecy is the gift of those people who have the capacity to apply the Word of God to specific circumstances, calling people to a renewed relationship with God and to treat their neighbors with love. On two of the four weekends of the Advent season just prior to Christmas, most Christians focus on the ministry of John the Baptizer. John was a prophet, sharing all the characteristics of those who had the gift of prophecy in the Old Testament. Often, as you can imagine, prophets aren’t wanted around. They speak truth that people and rulers would rather not hear. Jesus once lamented that Jerusalem, then the center of God-worship, had a history of killing off prophets. Prophets confront us with uncomfortable truths. Because the words shared by prophets come straight from God, the prophets themselves are often unaware of their full meaning. John the Baptizer called Jesus “the Lamb of God Who takes away the sin of the world.” And yet, while he was imprisoned, awaiting execution, he sent messengers to Jesus, asking if Jesus was the Messiah or if the Messiah was yet to come. The prophet simply shares God’s message, a person under command from God, and lives with the uncertainties about its implications. The prophet is only tangentially concerned with the future. She or he isn’t a seer, though a look into the future--as in the writings of the prophets Isaiah and Jeremiah--is often embedded in their prophecies. Prophets call people to repent--to turn back to God--for specific sins and injustices, telling people the consequences both of hard-heartedness and repentance. Prophets are especially called to confront injustices, whether those perpetrated by rulers or nations. This is why they can often be unpopular. Forty years ago, a Baptist pastor named Martin Luther King, Jr. had the gift of prophecy and delivered God’s message of opposition to racism and discrimination and advocacy of justice and harmony. King, like many prophets before him, was killed for sharing God’s message. Prophets call the Church to enact God’s particular brand of justice. As Father Walter Burghardt points out, Biblical justice differs from legal and philosophical notions of justice. The Bible affirms their notions of human rights and treating others fairly, but Biblical justice is so much more. The God of the Bible says that justice is only served when we love God and we love our neighbor as though they were another self. People with the gift of prophecy can often be irritating to the Church and to the world. But they call us to truly live out Jesus’ Great Commandment: to love God with every fiber of our beings and to love our neighbors as we love ourselves. Only a sadist would want the gift of prophecy, I suppose. But prophets are heroes for believers in Jesus.